Game of Thrones will be over in two seasons, but HBO is already peering around the corner for what’s next. The network is working on at least four spinoffs, with George R.R. Martin pitching in on a couple of them. 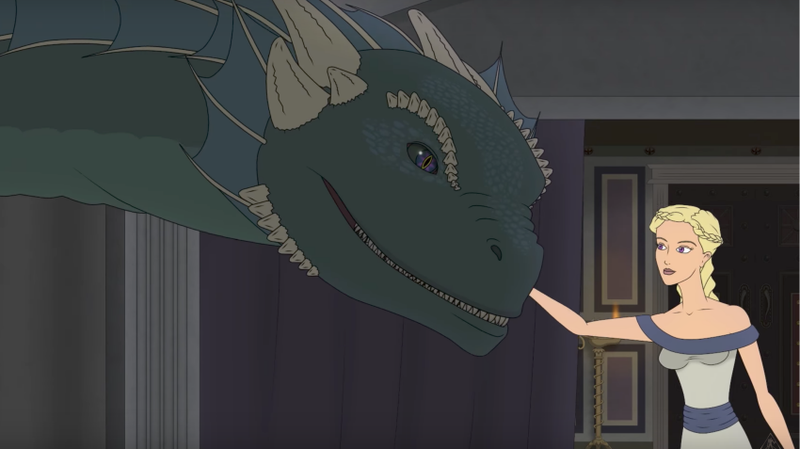 We have no clue what they’ll be about yet (although Dunk & Egg seems like a shoo-in), but one animated video is making a case for one of A Song of Ice and Fire’s most mysterious tales: The Doom of Valyria. Patrick McCarthy recently shared a 20-minute animated concept pilot for a Doom of Valyria series, which dives into the history of the Valyrian Freehold, the Targaryens, and what led to the downfall of one of the realm’s greatest civilizations. Given the story’s inspiration is the Fall of Rome, Doom of Valyria leans heavily into Greek and Roman design, highlighting the strong parallels between the two tales. The episode centers around Gaemon and Daenys, a Targaryen brother and sister who are about to be married. In this version of the story, this is the first high incestuous marriage in the Freehold, causing some conflicts and controversy. There are also rumors that Valyrian slaves working in the mines are starting to get aggressive, leading people to fear that they might revolt. I won’t spoil what happens, but the episode ends on a cliffhanger that indicates Doom for the Valyrian Freehold. Clarification: Dan Weiss and David Benioff will likely continue as executive producers on the spinoffs, but will step back from writing responsibilities.